Saturday, June 14, 2014, 9:00 a.m. This run is limited to 300, so don't wait too long and miss out. The single 8.2-mile loop starts and finishes at Sky Country Trailhead. 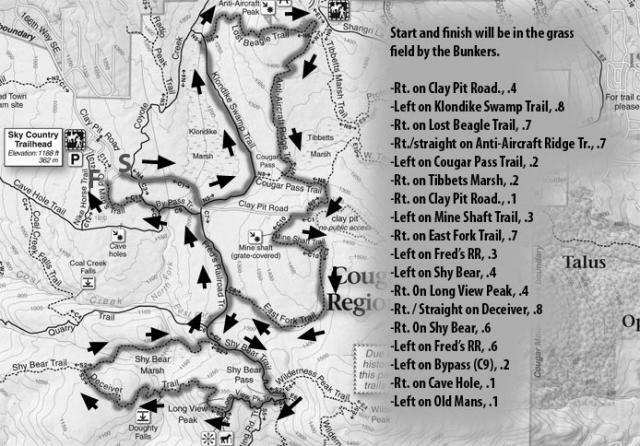 This course includes the entire 5-mile route, plus an added out-and-back to a loop of the Shy Bear and Deceiver trails, including a notable climb on the way out of the loop. Click HERE for larger image in PDF suitable for printing.